Never drawn the Ninja Turtles before. They were quite a big part of my childhood and used to draw them all the time. I went through quite a few different ideas for the background, but ended up liking this one the best. I wanted to add a bit of their personality into the designs, so I tweaked them a bit without going to crazy. I'm glad you like them. Never thought of doing action scenes to be fair. I'm going to need to at some point as I'll need it for my personal project. 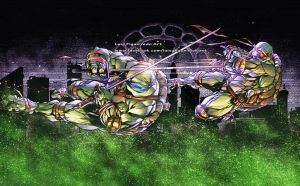 As a kid in the 90s, The Ninja Turtles were a huge part in my childhood! They still are to this day!